One advisor's suggestion was to write about each of the ideas I was working on to help clear my thoughts. I'll start with data probes. I wanted to do something similar for the data passing through those functions, so I created the prototype shown below. It displays the most recent value of the outer-most expression on each line just to the right of that line. If the outer-most expression is a function call, it also shows the values of the arguments. Similarly, here it should probably only show the values from the most recent call. Instead, it's showing you the most recent value on each line, which means there are values from both branches of the conditional simultaneously. The extra data adds a lot of noise. I think that will be true even with a less obtrusive color scheme. There's too much distance between the values and the expressions they correspond to. To interpret any of the values, you have to move your eyes back and forth several times. But I think the biggest problem isn't with the design, but with how I arrived at the design. Interviewees told me that showing only function arguments and return values (as Theseus does in the log) wasn't enough and that they needed to see intermediate values as well (which is clearly true). However, my only reason to arrive at this design rather than some other design was because it seemed most Theseus-y. This problem is under-constrained. I think that before I decide on a design I need to watch more programmers to develop some concrete use cases, as I did for Theseus’s call count features. Use some multi-finger such as three-fingers moving up reveals the information and moving them down hides it again. Use some kind of twisting hand gesture with a Leap Motion controller. Reveal the information as the user moves their face closer to the screen. The traditional gesture would be to press a hot key that toggles the display with a fluid animation― but these are more fun to think about, especially the last one, which I don't think has been tried before. I'd been meaning to research visual clutter and distraction with regards to programming visualizations and recently my advisor sent me a link to an article called "Taking a New Look at Subway Map Design". It alludes to a computational model of what people perceive in their periphery. That led me to Rosenholtz's publication page, which I am working my way through now. There's a lot of fascinating stuff here. I need to run some errands soon, so I'm going to plop my reading list here and fill it in with notes as I go. Visual search for arbitrary objects in real scenes. Do Predictions of Visual Perception Aid Design?. What your visual system sees where you are not looking. What your design looks like to peripheral vision. Feature Congestion: A Measure of Display Clutter. VisualIDs: Automatic Distinctive Icons for Desktop Interfaces. Halo: a Technique for Visualizing Off-Screen Locations. For example, i in a loop is a "stepper" and prevNode in a linked list algorithm is a "follower". They provide a list of 10 roles that they think are sufficient for 99% of the programs novices will write. They mention that Roles of Variables would help even experts to understand code, but I haven't read the literature to understand how. Often, several of those types of information applied to the same line, though often there was one type of information that seemed most appropriate in a given instance. For example, documentation might be appropriate for a call like arr.slice() since the function is supposed to take an argument and there isn't one, but alerting the programmer to the fact that arr is an empty array might be more important. That suggests to me that instead of trying to think of the thing to visualize (as I was earlier this month), I might want to think about how to support choosing the most appropriate information to display when there are several alternatives. My instinct tells me that it's a global optimization problem. There are several things I could display next to every line of code, and several sizes I could display them at, and my job is to choose the “best” combination of choices for the user's current task. Though, come to think of it, the leaves should probably be revealed first. Current debugging tools usually support viewing those values (and no others), so they're probably what people care about most often. I've been trying to figure out how to allow programmers to limit their queries in time. This is a time-varying code coverage display. The mock-up was created as a quick way of getting ideas onto pixels, so it's not entirely coherent. 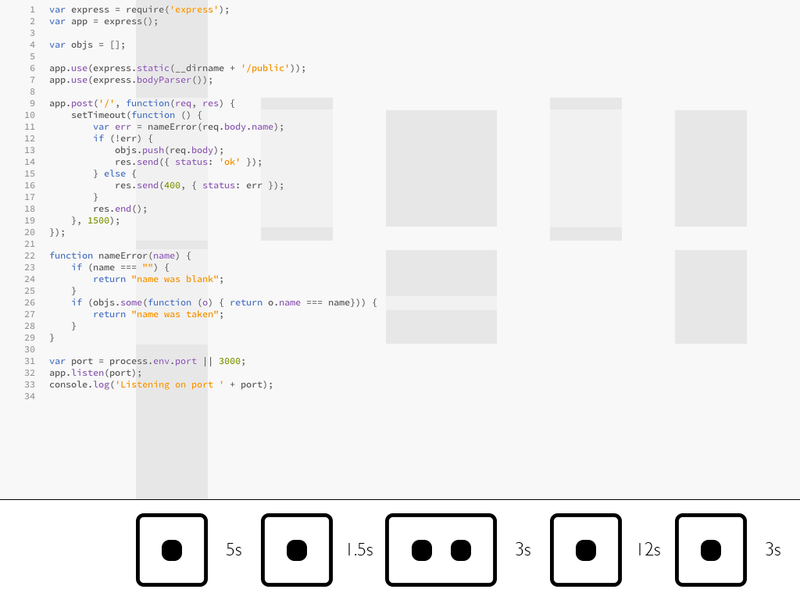 The basic idea, though, is to represent ticks along the bottom of the screen (added in real-time, of course), with vertical bars stretching from them into the background of the code. Where the bars intersect code that executed on that tick, they are colored (currently, in gray, which I think is a bad choice). There are some obvious extensions, such as showing the number of calls/iterations in the bars, coalescing ticks with no appreciable time between them (such as when process.nextTick() is used), showing which branches were taken, showing where exceptions occurred, etc. This visualization gives you a way to select regions of time such as those listed earlier (the thing that happened just now, etc.). That lets you filter things like log output and floating code tips. VM ticks are only one convenient granularity by which to split up the time axis. You could also use application events, such as those generated by jQuery, EventEmitter, or Backbone.js. The problem there is that events can nest, which complicates the visualization. I suppose the VM ticks are nested too, though, if you consider the causal chain that resulted in the tick occurring. But VM ticks have definite ends, whereas I don't think it's reasonable to say that the call graph of one event handler ends where the call graph of another event handler begins if they're connected by synchronous invocations. * Incidentally, I think that would make for a more usable stack trace: each of the entries in the trace is actually a 1-line editor window you could expand to see the rest of the function. This works in the code → execution time direction, but if you want to see all the code that executed for a given tick, another interface is necessary. Perhaps one that concatenates the sources of all the functions that executed. I've wanted to try to do this with split editors for a while*.